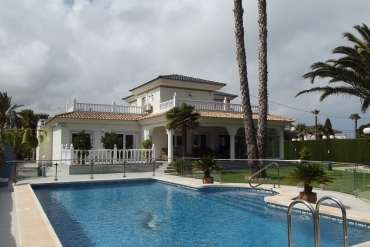 We invite you to discover our range of villas for sale in Orihuela Costa, Costa Blanca. Find your dream home in the Mediterranean with Casas Espania. To buy a villa in Orihuela Costa will be a wise decision as we are talking about one of the most interesting areas of Spain. 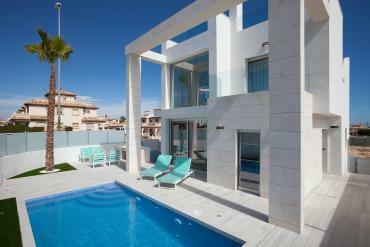 Currently we have a large number of both resale and new build villas along Orihuela Costa, Costa Blanca. Most of them are located really close to the beach and have lovely sea views. Cities and towns like Playa Flamenca, Mil Palmeras, Pilar de la Horadada, Cabo Roig or La Zenia are just some of the main places where is located our offer of villas in Orihuela Costa. Most of our villas for sale include such as interesting extras as private swimming-pool, garage, large terraces or exuberant gardens among others. In addition, if you are a passionate about golf, living in this part of the Costa Blanca South you will enjoy of a great offer of golf courses: La Finca Golf & Spa, Villamartín Golf, Vistabella Golf, Las Colinas or Las Ramblas are just some of the most prominent golf clubs in the area. One of the most interesting aspects of our offer of villas is their design. We provide you classic and modern villas for sale, so you can choose the architecture that you prefer. 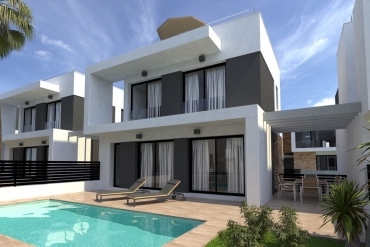 In both cases, Orihuela Costa is one of the best places in Spain where buy a villa as the light and the beautiful Mediterranean landscapes enhance the beauty of any construction. Remember that at Casas Espania we are able to provide you an experienced and personalized service, thus we will provide you a complete assistance during the whole purchase process as well as a great after-sales service. Just let us know what kind of property are you looking for and we will make it available to you. Please, feel free to contact us today if you are looking for villas for sale in Orihuela Costa, Costa Blanca.